Battery backup is a optional factory fitted optional feature of the VIDEO4 and have been specified at the time of ordering. in the event that power is lost for a short time, for example during cranking the VIDEO4 continues to record without a break. in the even that power is unexpectedly lost at the end of recording, typically when the main power kill switch is used, then the VIDEO4 can power itself to ensure that all recordings are completed. 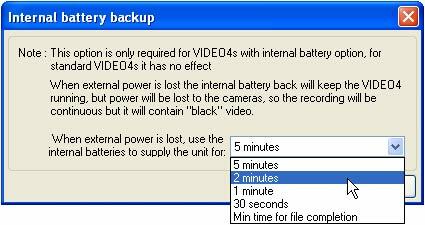 because the internal battery is charged from the external supply, until the VIDEO4 has been used for a while with an external supply then the internal battery will have no charge and will not be able to power the VIDEO4. the internal battery is only used to power the VIDEO4 electronics, the external cameras are not powered. This means that if power is lost (for example during cranking) then although the VIDEO4 will continue to record the recording for this period maybe blank depending on whether the cameras power supply requirements have been met. 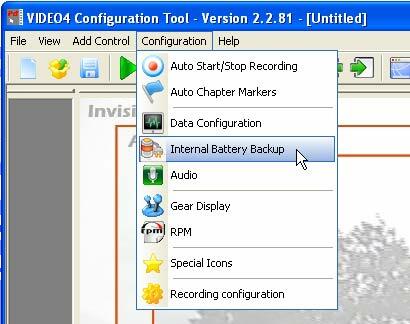 There is a configuration option in the �VIDEO4 Configuration Tool� that controls how long the internal battery runs the VIDEO4, this is under the �Configuration menu�, see below. This part of the configuration is saved along with all the other configured items when you write the VGL to the memory card and load it onto the VIDEO4 in the normal way.